Seth Towns ’20 averaged 17 points and eight rebounds per game during the team’s sweep of Yale and Brown last weekend. Senior co-captain Siyani Chambers (shown here against Yale on Friday) scored a season-high 19 points against Brown on Saturday. Senior co-captain Corbin Miller sank the first basket of the game on senior night against Brown on Saturday. 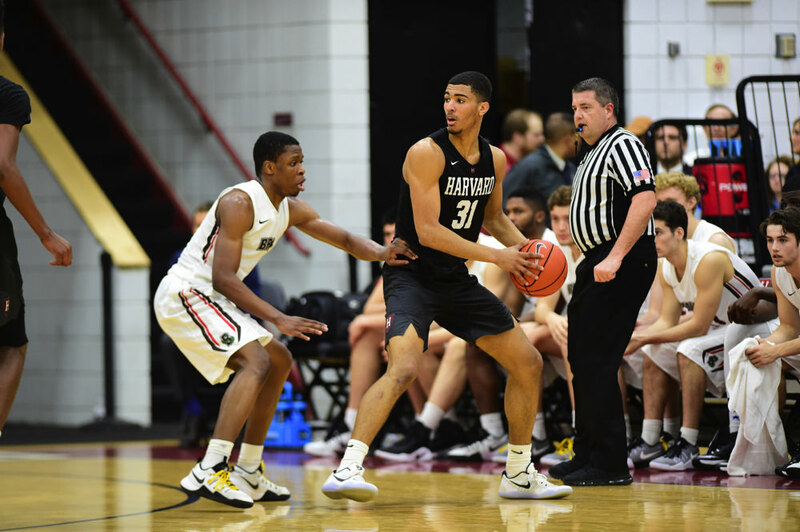 At a pre-season press conference in October, Stemberg men’s basketball coach Tommy Amaker sat on a leather couch in the glass-encased lounge overlooking Lavietes Pavilion and spoke cautiously about the team’s prospects. Although the Crimson had considerable returning talent—including all-Ivy veterans Zena Edosomwan ’17 and Siyani Chambers ’16 (’17)—and was adding a freshman class rated tenth in the country by ESPN, the coach warned that it could take time for the team to coalesce. “We’re finding ourselves and learning about ourselves right now, and we’re a work in progress,” he said. He stressed that he had “no timetable” for getting the team’s talented, large, and inexperienced roster to cohere. 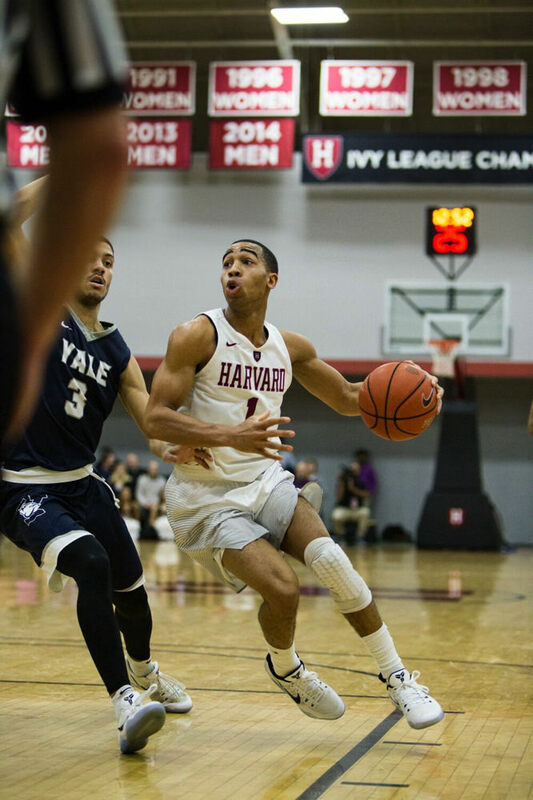 Paired with Harvard’s 77-64 win over Yale on Friday, the win over Brown showed improved ball movement and the evolution of freshman Seth Towns, crucial factors in the team’s growth. Still, Harvard struggled to defend the paint without fouling. The Crimson (18-7 overall, 10-2 Ivy) now prepares for the last weekend of the regular season and the inaugural Ivy League tournament. The play also showed the team’s improved ball movement. Earlier in the year, many Harvard players—particularly the freshmen, who were accustomed to being offensive stars in high school—often took ill-advised shots. The Crimson also turned the ball over against teams with disruptive zone defenses. This weekend, Harvard had 18 assists against both Yale and Brown (and 14 assists in the first half alone against the Bears). What’s more, the Crimson accomplished this against two very differently defenses—Yale primarily played man-to-man and Brown deployed a zone. Harvard’s offense has become more versatile. Less than two minutes into the second half of Friday’s game, with the Crimson trailing 36-35, Seth Towns eyed Yale’s Blake Reynolds holding the ball near the top of the key. As Reynolds passed to Sam Downey, the player Towns was guarding, the Harvard freshman extended his arm, stole the ball, and took off. The breakaway and two-handed dunk put the Crimson ahead 37-36. They would not trail their opponents again all weekend. The first-year’s game has evolved this year. Amaker has said that Towns—who scored more than 2,000 points in high school—and fellow freshman Bryce Aiken are “wired to score.” Earlier in the season, though, Towns was forcing his shots, and Amaker pushed him to do more rebounding and make contributions in other areas. The extra work Towns has put in on his shooting and conditioning showed: this weekend he had 18 points and eight rebounds against Yale, and 16 points and eight rebounds against Brown; he also made four steals and blocked one shot. Amaker tells his players, “No paint, no fouls.” In other words, the team should do everything it can to prevent opposing teams from getting the ball in the lane, but then not foul them if they do. During the last 10 minutes of the first half on Friday, when Yale went on an 18-9 run to take a 34-31 halftime lead, the Crimson struggled on both counts. The troubles began when Yale’s Trey Phills, coming off a pick-and-roll, penetrated, scored, and drew a foul on Edosomwan. Several minutes later, Yale’s Sam Downey beat Edosomwan on a cut near the basket, made a layup, and also drew a foul. Amaker substituted forward Chris Lewis ’20, who then picked up his second foul when Downey again caught the ball near the basket. The Crimson’s difficulties in stopping dribble penetration and defending without fouling are concerning partly because they aren’t easy to fix. 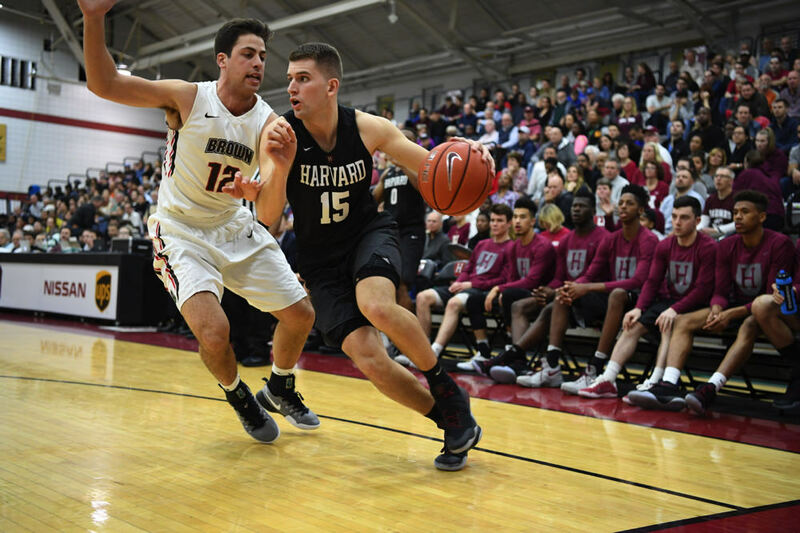 Harvard’s best guards, Aiken and Chambers, are extremely fast but small, which means they can be overpowered; two other guards, Corey Johnson ’19 and Corbin Miller ’15 (’17), are relatively slow, which makes it hard for them to keep opponents in front. And because the NCAA has in recent years encouraged referees to call hand-checking fouls more stringently, it is extremely hard to contain opposing guards off the dribble. Tidbits: On Saturday, the team honored its seniors—Fraschilla, Miller, Edosomwan, and Chambers—in a pre-game ceremony. Each player took the court with his family, and the public address announcer listed his career accomplishments. All four started, and Miller, Edosomwan, and Fraschilla hit the team’s first four field goals. Chambers went on to score a season-high 19 points. The Harvard women’s basketball team, after falling to Yale 57-52 on Friday, clinched a spot in the Ivy League basketball tournament with a 66-63 win at Brown on Saturday. Freshman Katie Benzan led the way with 24 points and six assists against the Bears. The Crimson (20-5 overall, 8-4 Ivy) will conclude the regular season with home games Friday and Saturday against the two teams ahead of them in the conference standings, Princeton and league-leading Penn.